The Rainforest Alliance is a global organization that strives to conserve bio-diversity and ensure sustainable livelihoods by transforming land-use practices, business practices and consumer behavior. Pacific Trellis Fruit is proud to take part with the global community to create a greener planet by sourcing fruits grown from Rainforest Alliance Certified™ farms. Rainforest Alliance Certified farms have met the standards of the Sustainable Agriculture Network (SAN), a coalition of leading conservation groups that links responsible farmers with conscientious consumers. 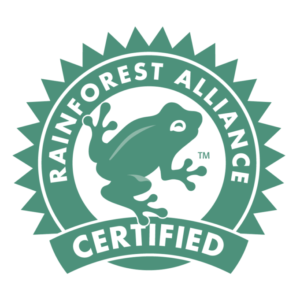 Rainforest Alliance certification promotes sustainable farm management and incorporates a range of environmental, social and economic standards, including water and soil conservation, wildlife protection, decent wages, housing and healthcare for farm workers, and access to education for farm children. Farms that meet these rigorous standards are awarded the Rainforest Alliance Certified seal. Less water pollution, as all sources of contamination (pesticides, fertilizers, sediment, wastewaters, garbage, fuels and so on) are controlled. Less soil erosion, as farms implement soil conservation practices such as planting on contours and maintaining ground cover. Reduced threats to the environment and human health, as the most dangerous pesticides are prohibited and all agrochemical use is strictly regulated, farmers must use mechanical and biological pest controls where possible and strive to reduce both the toxicity and quantity of chemicals used. Wildlife habitat is protected, as deforestation is stopped, the banks of rivers are protected by buffer zones, critical ecosystems such as wetlands are protected and forest patches on farms are preserved. Less waste, as farm by-products such as banana stems, coffee pulp, orange peels and unmarketable foliage are composted and returned to the fields as natural fertilizer. Other wastes, such as plastics, glass and metals are recycled whenever possible. Less water used, as water conservation measures are applied in washing and packing stations, housing areas and irrigation systems. More efficient farm management, as the certification program helps farmers organize, plan, schedule improvements, implement better practices, identify problems and monitor progress. Improved conditions for farm workers, who get fair wages, decent housing, clean drinking water, sanitary facilities and a safe and wholesome work area. Workers and their families also have access to schools, health care, transportation and training. Improved profitability and competitiveness for farmers, who have increased production, improved quality, reduced worker complaints and increased worker efficiency. The Rainforest Alliance Certified seal of approval offers farmers more leverage at the time of sale, product differentiation, premium prices and improved access to credit. More collaboration between farmers and conservationists. Parks alone cannot save the world’s biodiversity; we have to ensure that wild flora and fauna find refuge outside of protected areas. Because farmers control the fate of so much land and so many critical habitats, their ideas and willingness to participate are essential to any local or regional conservation strategy.